Lin-Manuel Miranda, among others, composed the music for the animated film and he talked about working with "The Rock." All right, with the crazy six-pack and ridiculous gum show on display, Dwayne Johnson already looks super-human. Just wait till you see him in animated form drawing on his musical talent, who knew, for Disney's new blockbuster "Moana." Here's ABC's Nick watt. Murdering little pirates. Reporter: I think it's a fun-filled adventure, but its male costar thinks "Moana" is a tear jerker. Ocean, do something! Help us! I've never cried consistently -- the cameramen are laughing -- through a movie than I have with this movie. Just to be clear, they're manly tears. 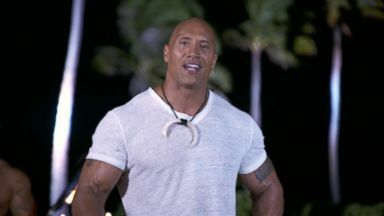 Reporter: Dwayne "The rock" Johnson voices a fun-loving demi god maui who kind of messes up -- You will restore the heart! Ah! Reporter: And it's young moana's job to save her mythical pacific island from his folly, unleashed a terrible curse. This is a young girl driving the story, saving the world. A new version of a female hero. There is no love interest, no damsel in distress character in her. She represents so many 15, 16-year-old girls out there. I have a 15-year-old daughter who is just like moana, who's ambitious and has a really strong point of view and wants to tackle the world, loving tapping into her own identity and putting me in my place. You are not my hero! And I'm not here so you can sign my oar! There are parts of your story reflected in this movie. This handsome, brown-eyed soul. Exactly. Reporter: I was talking about the ups and downs, highs and lows of his career. You just earned yourself a dance with the devil. Reporter: He's the star of the "Fast and furious" franchise and the world's highest-paid actor. But life wasn't always so good. Played football. Didn't make it. Failed at that. There were a lot of failures that maui's had to go through as well. Reporter: Moana too, in this movie made by our parent company Walt Disney. She's going to trip and fall and she's going to learn a lesson as she goes along. Enjoy the island! Maui out. No, stop, hey, put back the heart! There's a great line in the movie where I think my character says, no, you're a princess. She's very adamant, I'm not a princess, I'm the daughter of the chief but I'm not a princess. And I say something like, listen, you've got a dress and a sidekick. Then you're a princess. Very funny. It's the best line in the movie. It's a good line. And I said it. It's a good line. It's my line. Yeah. Well done. Well done. Thank you. And you will journey to -- ah! Reporter: The message here, never give up. And she's back. And there's also another message that I got a pretty good singing voice. ??? When you were waddling yay high this guy ??? ??? when the nights got cold who stole you fire from down below ??? 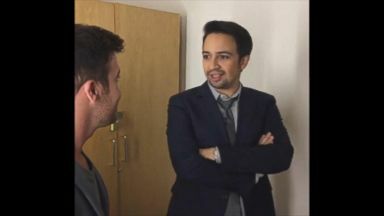 Reporter: Music composed by among others lin-manuel Miranda of "Hamilton" fame. ??? We read the wind and the sky when the sun is high ??? ??? we sail the lengths of the seas on the ocean breeze ??? How did you find the time? I got this job about six months before "Hamilton" started rehearsals. Actually, it's exactly seven and a half months. I know it because I found out I was going to be a father the same day I found out I got the job. It was one of those life-changing days. I'd have Skype meetings at 5:00 A.M. With the team in Burbank, they've in their sweats and clothes, and I was in an 18th century blouse because I was going to be onstage later. It's fair to say you're a fairly physical actor. "Walking tall." "San Andreas." "Hercules." Hercules! 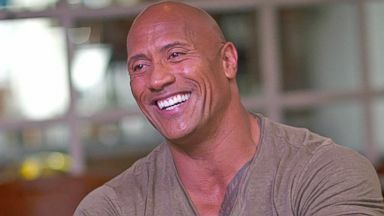 Reporter: We usually see "The rock." That's kind of the point. You hear Dwayne "The rock" Johnson, oh, there's going to be a character who's going to punch people out, it's going to be awesome. How was it to try and project just using your voice? It was exercising a different muscle. It was a great challenge. I roll my sleeves up when I'm challenged that way. There's multiple cameras on you, just like this. As you're saying these lines and how you say them, how your facial expressions are delivering the lines. So all that is infused into the animation. The ocean's straight up kooky-dukes! Reporter: If I was pitching this movie I'd call it a ballsier "Frozen". You have Samoan ancestry? Polynesian descent. It was an opportunity for us to showcase polynesian culture to the world on the big screen in a way that had never been showcased before. We're talking about a system of navigation that is unequaled, to be able to sail into the open sea without maps and compasses and go from one island to find the next by reading the world. And the metaphor of, I have to keep my island and where I'm from in my mind and fixed so I know where I'm going. I mean, you can't ask for a better metaphor as a songwriter. Here's a fun fact. The shape of maui and his look, a lot of that was based off my grandfather. He looked like that. Samoan high chief who has high chief tattoos all over his body. Your grandfather who was a wrestler as well? Correct. You are not the hero, you're a bit of a goofball at points. Well, you know. Goofball is a little strong. Don't be angry. 15 Samoans beat your In rugby. He's got this thing. He played Brigham young when he was in college, 15 Samoans were on the team. He sees my character, it's goofball. Holding on to resentment clearly here. Reporter: I'm Nick watt for "Nightline" in Los Angeles. "Mu Juan that" is in theaters now. Johnson, who plays a demigod Maui, describes the new version of a hero that "Moana" represents and jokingly admits that he's never cried more than while making this movie. Johnson, who voices ocean demigod Maui in Disney's upcoming animated film, "Moana," shares a new trailer on "GMA." 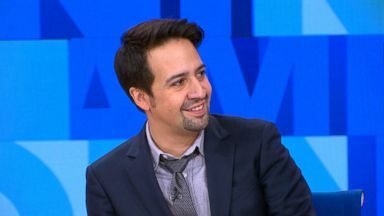 Ginger Zee talks to Grammy and Tony award winner and "Hamilton" creator Lin-Manuel Miranda on his upcoming projects with Disney. The acclaimed actor, rapper and writer dishes on his latest projects.